Burt Reynolds died at age 82. He was a great actor and also noted for his rugged stunt work in movies. Thanks Dan - That's a nice picture. 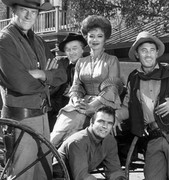 It was nice to see Burt on "GunSmoke" this morning. I liked Norm Macdonald's impersonation of Burt on "Saturday Night Live" - so funny! Rest in peace, Burt! My favorite piece of his acting was a wicked send-up was a wicked send-up of method actor marlon brando on the twilight zone.